This page is part of the Netninja.com Hipster PDA templates. For more templates see the index of Hipster PDA pages. For details about how I use these templates in my everyday life, look for posts tagged "hipsterpda." 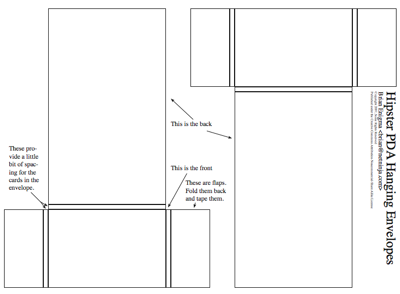 These are technically not Hipster PDA cards, but a template for a “hanging folder” that you can stick to a wall or other surface. I use a couple at work for quick access to a few cards. This is a basic “hanging” envelope. 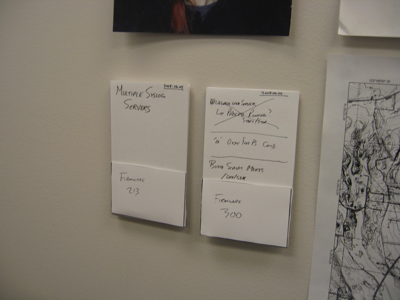 At work, I use them to group a set of to-do cards by affixing them to the wall and writing the overarching topic upon the face. Because the face of the envelope covers only half of the card, I am able to see most of the topmost task card. The envelopes are best affixed to the wall with a low-profile device such as tape, that gummy poster putty stuff, a flat fridge magnet (for a filing cabinet or refrigerator), or a fairly flat tack. This is a great idea, thanks!